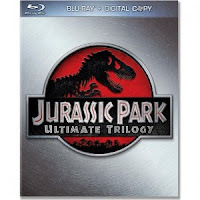 Jurassic Park Ultimate Trilogy Blu-ray only $19.99 PLUS Get $10 Amazon Credit! Wow, head over to Amazon and you can get the Jurassic Park Ultimate Trilogy Blu-ray set for only $19.99! To sweeten this deal, you'll get $10 in Amazon credit! NOTE: To get this price, you may have to click on the "# new from" button. There's two that you can click, I circled them below. The store, Official NBC Universal Store, is selling it at this price. It should be the first one that shows when you click it. Order the Jurassic Park Ultimate Trilogy on Blu-ray and get a $10 promotional credit toward the purchase of items shipped and sold by Amazon.com (certain exclusions apply, including Kindle books, MP3s, and video rentals and downloads). The promotional credit will be added directly to your Amazon.com account within two days after your order ships. Offer valid when shipped and sold by Amazon.com. Limit one per household. Amazon reserves the right to change or terminate this promotion at any time. Shipping isn't included, but is only $2.98. Not a bad deal for $22.97!